The word ceramic is derived from the Greek word κεραμικος (keramikos), which means "having to do with pottery." The term covers inorganic, nonmetallic materials that have been hardened by baking at a high temperature. Up until the 1950s or so, the most important of these were the traditional clays, made into pottery, dinnerware, bricks, tiles, and the like. Since then, new materials called advanced ceramics have been prepared and are being used for a wide range of applications, including components used by the aerospace, automotive, defense, environmental, fiber-optic, and medical technologies. Ceramic parts are also used in cellular phones and personal computers. Each of NASA's space shuttles has a coating of roughly 34,000 ceramic tiles, which protect it from the searing heat (up to 2,300 °F) produced during reentry into the atmosphere. Thus, advanced ceramics are an integral part of the modern technological revolution. The American Society for Testing and Materials (ASTM) defines a ceramic item as "an article having a glazed or unglazed body of crystalline or partly crystalline structure, or of glass, which body is produced from essentially inorganic, nonmetallic substances and either is formed from a molten mass which solidifies on cooling, or is formed and simultaneously or subsequently matured by the action of the heat." The word ceramic can be used as a noun that refers to the material or a product made from the material. Alternatively, ceramic may be used as an adjective that describes the material. In addition, ceramics is a singular noun referring to the art of making things out of ceramic materials. Traditional ceramics have been mainly silicate-based. Advanced ceramics are made from various other types of materials as well. Depending on their composition, they are classified as oxides, non-oxides, and composites. Non-oxides: carbides, borides, nitrides, silicides, and silicates. Composites: particulate reinforced, combinations of oxides and non-oxides. The materials in each of these classes can have unique properties. Barium titanate (often mixed with strontium titanate), which has properties called ferroelectricity and piezoelectricity, is widely used in electromechanical devices known as transducers, as well as in ceramic capacitors and data storage elements. Bismuth strontium calcium copper oxide (BSCCO) is a high-temperature superconductor. Boron carbide (B4C) is used in some types of personal, helicopter, and tank armor. Boron nitride takes on physical forms that are similar to those of carbon: a graphite-like form used as a lubricant, and a diamond-like one used as an abrasive. Bricks, which are mostly aluminum silicates, are used for construction. "Cermet," the name given to a composite of ceramic and metal, is used to produce capacitors, resistors, and other electronic parts for high-temperature applications. Earthenware is often made from clay, quartz, and feldspar. Ferrite (Fe3O4), which is ferrimagnetic, is used in the core of electrical transformers and in magnetic core memory. 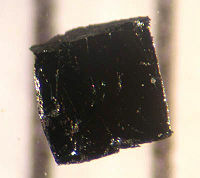 Lead zirconate titanate (also known as PZT) is a ferroelectric and piezoelectric material and has similar uses as barium titanate mentioned above. Porcelain, which usually contains the clay mineral kaolinite, is used to make decorative and household items. Silicon carbide (SiC) is used as an abrasive, a refractory material, and a "susceptor" that helps cook food in microwave furnaces. Steatite (a type of soapstone) is used as an electrical insulator. Uranium oxide (UO2) is used as fuel in nuclear reactors. Yttrium barium copper oxide (YBa2Cu3O7-x) is another high-temperature superconductor. Zinc oxide (ZnO) is a semiconductor and is used in the construction of varistors (a class of electrical resistors). Zirconia, which in the pure form undergoes many phase changes when heated, can be chemically "stabilized" in several different forms. Most ceramic knife blades are made of this material. Also, as it is a good conductor of oxygen ions, it could be useful in fuel cells. In the early 1980s, Toyota researched production of a ceramic engine that could run at a temperature above 6,000 °F (3,300 °C). Ceramic engines do not require a cooling system and hence permit major weight reduction and higher fuel efficiency. In a conventional metallic engine, much of the energy released by combustion of the fuel must be dissipated as waste heat, to prevent the metallic parts from melting. Despite these desirable properties, such engines are not being mass-produced because it is difficult to manufacture ceramic parts with the requisite precision and durability. Imperfections in the ceramic material can lead to cracks and potentially dangerous equipment failure. Efforts are being made to develop ceramic parts for gas turbine engines. Currently, even blades made of advanced metal alloys for the hot section of an engine require cooling and careful limiting of operating temperatures. Turbine engines made with ceramics could operate more efficiently, giving aircraft greater range and payload for a set amount of fuel. Since the late 1990s, highly specialized ceramics, usually based on boron carbide, have been used in ballistic armored vests to repel large-caliber rifle fire. Such plates are commonly known as "small-arms protective inserts" (SAPI). Similar technology is used to armor the cockpits of some military airplanes because of the lightness of the material. Recent advances in ceramics include bio-ceramics such as dental implants and synthetic bones. Hydroxyapatite, the natural mineral component of bone, has been synthesized from a number of biological and chemical sources and can be formed into ceramic materials. Orthopedic implants made from these materials bond readily to bone and other tissues in the body without rejection or inflammatory reactions. Hydroxyapatite ceramics, however, are usually porous and lack mechanical strength. They are therefore used to coat metal orthopedic devices, to aid in forming a bond to bone, or as bone fillers. They are also used as fillers for orthopedic plastic screws to help reduce inflammation and increase absorption of the plastic materials. Work is being done to make strong, dense, nano-crystalline hydroxyapatite ceramics for orthopedic weight-bearing devices, replacing metal and plastic materials. Ultimately, these ceramic materials, with the incorporation of proteins called collagens, may be used to make synthetic bones. Ceramic materials can be crystalline or amorphous (lacking a definite structure). They are hard and resistant to high temperatures. In addition, they tend to be porous. The pores and other microscopic imperfections act as stress concentrators. As a result, ceramic materials are brittle—when placed under stress, they fracture rather than becoming deformed. The study of ceramics consists to a large extent of ways to accentuate the strengths and mitigate the limitations of the materials, as well as to develop new uses for these materials. A number of ceramics are semiconductors. Most of these are oxides of transition metals, such as zinc oxide. 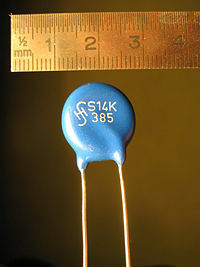 One common use of these semiconductors is for varistors. These are electrical resistors with the unusual property of "negative resistance." Once the voltage across the device reaches a certain threshold, a change in the electrical structure of the material causes its electrical resistance to drop from several megaohms down to a few hundred ohms. As a result, these materials can dissipate a lot of energy. In addition, they self reset—after the voltage across the device drops below a threshold, its resistance returns to being high. This property makes them ideal for surge-protection applications. The best demonstration of their ability can be found in electrical substations, where they are employed to protect the infrastructure from lightning strikes. They have rapid response, require low maintenance, and do not appreciably degrade from use. When various gases are passed over a polycrystalline ceramic, its electrical resistance changes. Based on this property, semiconducting ceramics are used to make inexpensive gas sensors. Under some conditions, such as extremely low temperatures, some ceramics exhibit superconductivity. The exact reason for this property is not known, but there are two major families of superconducting ceramics. Many ceramic materials exhibit the property of piezoelectricity. A piezoelectric material develops a voltage difference between two faces when compressed or made to vibrate. This property links electrical and mechanical responses. Such ceramics are used in digital watches and other electronics that rely on quartz resonators. In these devices, electricity is used to produce a mechanical motion (powering the device) and the mechanical motion is in turn used to generate an electrical signal. The piezoelectric effect is generally stronger in materials that also exhibit pyroelectricity. Such materials generate an electrical potential when heated or cooled. All pyroelectric materials are also piezoelectric. Thus, pyroelectric materials can be used to interconvert between thermal, mechanical, and electrical forms of energy. Such materials are used in motion sensors, where the tiny rise in temperature from a warm body entering a room is enough to produce a measurable voltage in the crystal. Pyroelectricity, in turn, is observed most strongly in materials that also display the ferroelectric effect. Ferroelectric materials have a spontaneous polarization (formation of an electric dipole) that can be reversed by applying an electric field. Pyroelectricity is a necessary consequence of ferroelectricity. Barium titanate and lead zirconate titanate have both piezoelectric and ferroelectric properties. They are used in the manufacture of capacitors, high-frequency loudspeakers, transducers for sonar, and actuators for atomic force and scanning tunneling microscopes. Some crystalline semiconducting ceramics (mostly mixtures of heavy metal titanates) can conduct electricity as long as they are below a certain "transition" temperature. When heated above that temperature, their "grain boundaries" (boundaries between the little crystals that make up the material) suddenly become insulating, breaking the circuit. Such ceramics are used as self-controlled heating elements in, for example, the rear-window defrost circuits of most automobiles. Non-crystalline ceramics, being glasses, are usually formed from melts. The glass is shaped when fully molten or when in a state of toffee-like viscosity, by methods such as casting or blowing to a mold. If the material becomes partly crystalline by later heat treatments, the resulting material is known as a "glass ceramic." Crystalline ceramic materials are generally processed by one of two approaches: (a) the ceramic is made in the desired shape by reaction in situ, or (b) powders are "formed" into the desired shape and then heated ("sintered") until the particles adhere to one another and produce a solid body. Some methods use a hybrid of the two approaches. This method is most commonly used for producing cement and concrete. In this case, the dehydrated powders are mixed with water, which starts what are called hydration reactions. As a result, long, interlocking crystals begin to form around the aggregates. Over time, a solid ceramic is produced. The biggest problem with this method is that most reactions are so fast that good mixing is not possible, preventing large-scale construction. On the other hand, small-scale systems can be made by "deposition" techniques—various materials (reactants) are introduced above a substrate, and made to react to form the ceramic on the substrate. This process borrows techniques from the semiconductor industry and is very useful for making ceramic coatings. The term sintering refers to the process of heating a material at a temperature below its melting point, so that the particles adhere to one another. In a sintering-based approach, the object (called a "green body") that is prepared from a powder is initially held together loosely, but it is hardened by baking in a kiln. The pores in the object close up, so that the body shrinks and is converted to a denser, stronger product. There is virtually always some porosity left, but the real advantage of this method is that the green body can be produced in a wide variety of ways and then sintered. Slurry can be used in place of a powder, then cast into a desired shape, dried, and sintered. This approach is used for traditional pottery, in which a plastic mixture is worked by hand. When a mixture of different materials is used to form a ceramic, the sintering temperature is sometimes above the melting point of a minor component, leading to "liquid phase" sintering. In this case, the sintering time is shorter than for solid phase sintering. C 242-01 Standard Terminology of Ceramic Whitewares and Related Products. West Conshohocken, PA: ASTM International. Richerson, David W. Modern Ceramic Engineering: Properties, Processing, and Use in Design, 3rd ed. CRC Press, 2005. "Discovering a Hidden Industry." The World & I (December 1998): 154. This page was last modified on 24 January 2017, at 17:04.